Image caption Alain Juppe has called the build-up of migrants and refugees near Calais "disastrous"
The French government is "definitely" going to close the UK border post in Calais after Brexit, a close ally of presidential election frontrunner Alain Juppe has told the BBC. Arnaud Danjean said France no longer wanted the "negative burden" of migrants aiming to cross the Channel being detained on its soil. The change would be an "uncomfortable consequence" of Brexit, he said. The UK government wants the post in Calais to remain in use. Speaking to BBC Radio 4's Analysis programme, Mr Danjean, a member of the European Parliament for the Republicans, France's main centre-right party, said most French voters felt "disappointed" by the Brexit referendum. Analysis is broadcast on BBC Radio 4 on Monday from 20:30 GMT and will be available on BBC iPlayer and the programme's own website. 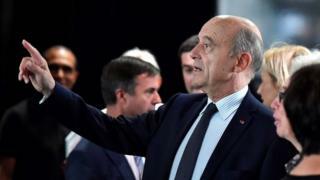 He acts as a spokesman for the campaign of Mr Juppe, regarded as the frontrunner for next year's presidential election, and reiterated Mr Juppe's call to close the UK border post in Calais, established by the 2003 Le Touquet treaty between the UK and France. He said: "It's a consequence [of Brexit]. It's not a punishment. It's an uncomfortable consequence for Britain." Mr Danjean told Analysis: "When it comes to border management, we will have to find a new agreement, definitely, because you can't make as if nothing has happened. "And we all know that the vote for Brexit was mainly expressed because of migration and immigration issues. So, it has an impact and we cannot continue like this. "I cannot imagine a French politician and a French president telling people, 'Well, you know, the Brits have decided to leave but we have to enforce the border at our border'. This would be very hard to explain." "On this very important issue of border management, an effort should be made also on the British side." Despite Mr Juppe's statements about moving border checks, Downing Street has said it expects the Le Touquet agreement to continue. Asked to respond to the comments from No 10, Mr Danjean said: "I can understand the position, but I'm not sure it's a sustainable one." The Le Touquet treaty allowed the UK and France to set up immigration controls in each other's Channel ports. It was worked out between the two countries, rather than being a European Union arrangement. Without the agreement, UK officials would have to wait until people and vehicles arrived in the country. But several senior French politicians say the build-up of thousands of refugees and migrants on the French side of the Channel has caused the country damage. Mr Juppe described it as "disastrous " for France's image, while having "extremely serious economic and security consequences for the people of Calais". But the UK government has said it is "committed to working together to protect our shared border in Calais" and to maintaining the current controls. Florian Philippot, head of strategy and communication for the anti-immigration National Front (FN) party, said the Le Touquet agreement had been "poorly negotiated", but criticised the idea of moving the UK's Channel borders. "The problem with that is that there will be many dead in the Channel," he said. "That seems obvious because migrants will want to cross, will be able to cross, since the border will be moved to Dover."